Mayor bowser: Stand Up For DC Residents. DONT Settle with Exelon. Mayor Bowser is under pressure to settle in the Exelon-Pepco merger. We need to remind her that her job is to stand up for OUR interests- not corporate interests. The Maryland's government recently filed a brief and concluded that "the merger provides no benefit to ratepayers." 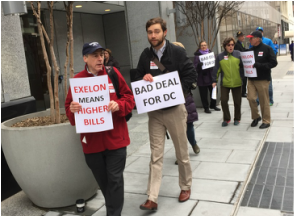 Maryland is not going to settle with Exelon and DC should not either! Fill out the form to send a message to Mayor Bowers, and cc the DC Council members.